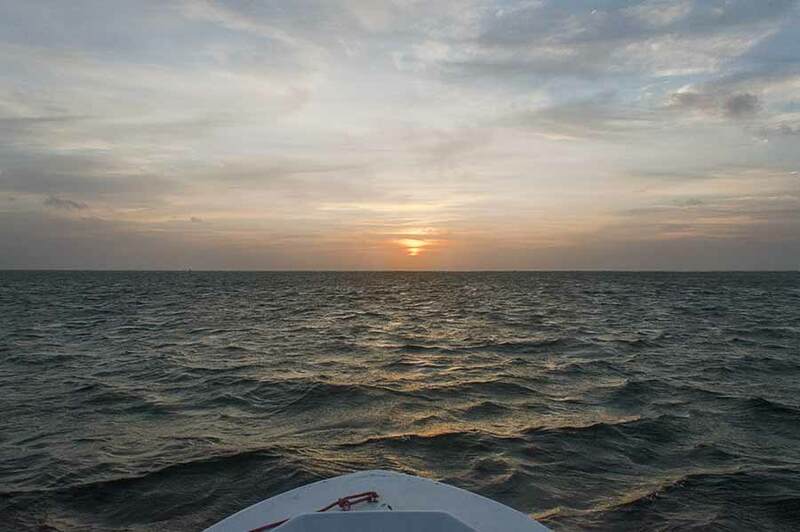 Belize NMS: Fair, warm and mostly dry conditions prevail. 24-hour forecast: Sunny with cloudy spells today and cloudy at times tonight. Showers will be isolated, along with the chance of an isolated thunderstorm developing over inland and southern areas this afternoon. General Outlook: For Wed. and Wed. night is for cloudy spells with isolated showers and isolated thunderstorms, especially Wed. afternoon, over inland and southern areas. Today E-SE 5-15 kts Choppy-Moderate 3-6 ft FAIR AND DRY. Tonight E-NE 5-15 kts Choppy 3-6 ft ISOLATED SHOWERS. Outlook E-NE 5-15 kts Light Chop-Choppy 2-4 ft ISOLATED SHOWERS. Undersea volcano Kick' em Jenny, north of Grenada near 12.18N 61.38W, is in a state of unrest. The government of Grenada advises mariners to observe a 5 km or 3.1 nm exclusion zone around Kick'em Jenny. Please refer to the webpage, www.nadma.gd, for additional information. Broad upper level anticyclonic wind flow spans the area. A surface ridge passes through the Atlantic Ocean, to SE Cuba near 21N78W, to the border of Costa Rica and Panama. High pressure north of the region will support fresh-to-locally strong trade winds across the south central Caribbean Sea during the next several days. 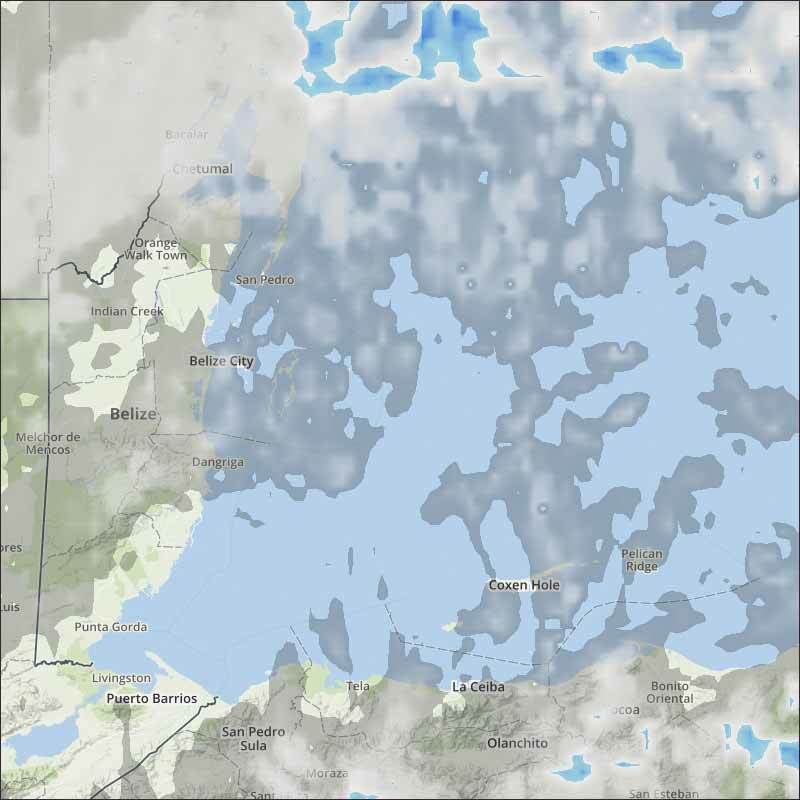 Winds will reach near gale-force along the NW coast of Colombia during the overnight hours. On Ambergris Caye this morning the wind is blowing from the E-SE at 16 mph and it's making the sea around our Barrier Reef rough. 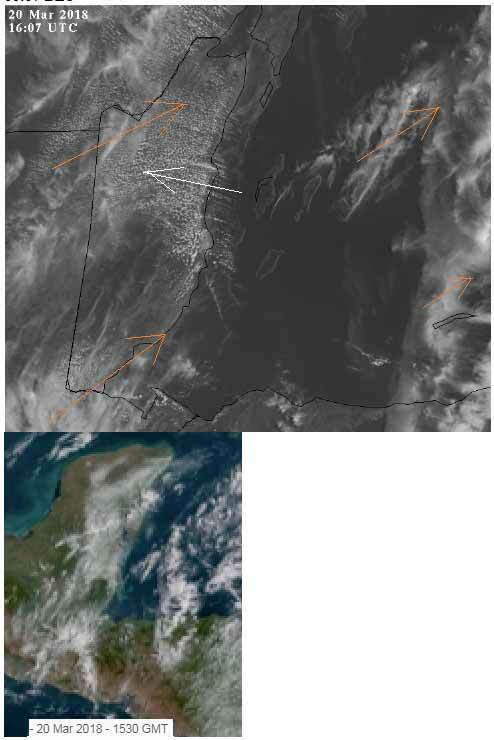 The day is sunny with and expected high of 89 f.
There is more, significant high-level SW cloud coming over most of Belize this morning, there is some Caribbean low-level cloud coming in from the ESE. There is still some fog in parts, that is lifting but causing a hazy start to the day. The Cloud picture. 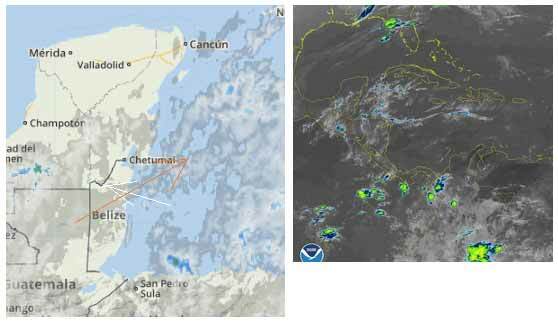 High-level cloud dominating our weather today, but there is regular Caribbean low-level clouds over central and northern Belize.